I have a function which fetches the Glide screen width and height and passes it to some set-up function (sub_457048). Am I wrong here? Is IDA wrong? Or is nobody wrong? You'll need to change the prototype of _grSstScreenWidth() to be a __usercall function with the return value in ebx. I am probably late for this, but for future visitors: the parameters to sub_457048 are passed in eax and edx. The call to _grSstScreenHeight is returned in eax and then saved in ebx, and finally moved in edx. The call to _grSstScreenWidth is returned in eax. so sub_457048 will be eax (width) and edx (height) which is correct. 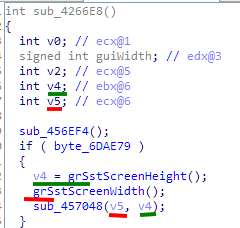 The intermediate step to store the value in ebx, is because it's not known to the caller if _grSstScreenWidth will overwrite edx (as it is allowed to, according to the STDCALL calling convention https://en.wikipedia.org/wiki/X86_calling_conventions#stdcall). On the other hand, _grSstScreenWidth has to preserve ebx.